Easy To Teach! Easy To Learn! Easy To Remember! Course content is aligned with the HEOA & CEE Financial Literacy national standards and is suitable as either a core curriculum or as a supplement to an existing course. Logical, sequential curriculum framework which is adaptable to student learning level, group size and varying class schedules. Money principals and concepts have undergone 10+ years of classroom development for learning and retention effectiveness. Learn sound money habits for each of the five domains of financial decisions: Spending, Saving, Investing, Protecting and Borrowing. Students can access the eLearning course anywhere at anytime to get the financial knowledge and support they need! 30+ years as both a business educator and financial advisor bring real-life relevance to financial literacy with knowledge, tips and tools. Easy to understand guide on growing up to become responsible, clear-thinking individuals who can make wise life decisions. Busch presents a compelling explanation of how, throughout life, one can make better decisions about money… he does what almost no other financial writers do, without insulting our intelligence he makes certain that even the most elementary issues are understood… a blessing not only for the high school…but for any of us lacking knowledge of monetary matters… A most enjoyable and illuminating ride! Your presentation was super informative and got me thinking about aspects of money that I had never thought about before… I really like the “Jiminy Cricket” effect of your budget system… I started to save my receipts immediately and noticed so much useless spending. 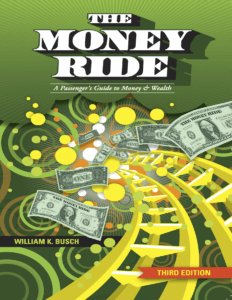 We’ve used the concepts and activities in “The Money Ride” to teach financial literacy to all grade levels. Bill is an amazing resource and customer service from the Money Ride team is outstanding.